1. The end of May brings about the perfect storm: cookouts, graduation parties and scurrying around at the last minute trying to put some teachers' gifts together. 2. Throw in a kid with a sinus infection and a mom who has had two migraines in the last four days and it's the storm of the century. 3. And, you'll have the longest break in blogging since the swine flu/pneumonia diagnosis/pulmonary embolism scare of 2009. 4. The shot of Toradol your doctor gives you may not help your pain and the Treximet he wants you to try might make you feel like your skin is wiggling off of your body and cause you to throw up your beef Quesadilla. 5. But, he could prescribe you some Ambien. 6. Which makes everything much better. 7. Though, if you get another migraine, you might want to stab yourself in the temple. 8. Which would make a good blog post, but it could totally ruin your carpet. I have five more work days until summer break starts. FIVE. I am excited about this for many reasons, but mostly because it will free up time to paint peeling ceilings and doors which dogs slam their noses into because they think they are ajar. Judging by the velocity at which our two dogs run into our storm doors, they clearly picture an enormous lamb shank on the other side. I also work as a cook (read: lunch lady) in an old school with a single window air conditioner which blows out such a lack of cold air that we might as well have a politician standing in the corner. Or my hair dryer. Same difference. I took the job because my son sometimes chokes when he eats, which has happened this school year exactly none times. I'm pretty sure my boss thinks it was a lie and that I really wanted to work there because I truly enjoy smelling like pepperoni. There are benefits to my work outside of that choking thing and the fact that I have the same days off as my kids and never have to worry about child care. Mainly, that I can occasionally sneak a curly fry and that when we make green beans there is a veggie steam that coats my skin. That's right. Free facial. But, my house misses me. A lot. If I could read her emotions by looking at her cluttered basement or weed-filled flowerbeds I would see her crying. Crying like she just watched The Champ. She's tired of her stained carpet and unwashed windows. I think my house would leave me for another owner if it could. So I have started my list of summer chores. It's long and ambitious, but I'm confident that I will have the energy and motivation to get some stuff done. If I can cook for 200 people in a kitchen that is to me what water was to the Wicked Witch of the West, than I can certainly get a few chores crossed off of my list. Because even though my house is falling apart, the central air conditioning works like a charm. 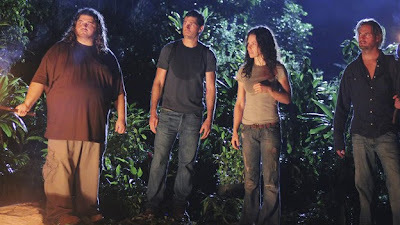 There has never been a show that made me think as much as LOST. I would like to offer a huge thank you to the writers for making me use my brain. I will miss this series. A lot. What in the world am I going to do with my Tuesday nights now? Well, I suppose there is always Dancing with the Stars. See? My mind isn't working right already. "Although I did pass fifth grade, it was a long time ago. You will have to ask Dad to help you with this math homework." "I wish I was pregnant with twins so I would have an excuse for this body." "Don't you dare go out on me." "I know that you love icing, but that does not make okay for you to lick it off of your classmate's cupcake." "I'm sure that it's fun for a boy to wear his first cup, but you probably shouldn't slam that stainless steel water bottle against your private parts to make sure it's working." You know how you stay up late with your husband drinking homemade, blackberry wine and then you wake up at 4:30am and can't go back to sleep, and four hours later you get on a school bus with 30 first graders for a zoo field trip, and then you walk around for four hours in the rain, and you watch a gorilla regurgitate and re-eat it over and over again, and sometimes the gorilla eats its own boogers, and then you go to lunch and give thanks that you didn't pack guacamole, and then a bug flies in your mouth, and on the bus ride home your son sleeps the entire way, which means he doesn't fall asleep until way-to-late-o'clock on a school night? I have a good friend with whom my family spends a lot of time. I would like to say it's because our older daughters are in the same class and play a lot of sports together, or because her younger daughter and my son are nine months apart. But, pretty much, it's because we both like beer. My friend's father is in his eighties and lives with her and her family. We call him Pops. My eight year old son and Pops have a great relationship, despite the more than seven decades between them. They both tire easily, they are both hard of hearing and they both have heart problems. It's kind of a match made in heaven. It turns out, they both have eye problems too. Although I had never noticed, my son picked up on the fact that Pops' right eye looks different from his left. Thank goodness the entire family is aware of my child's blatant honesty, because he didn't have any problem mentioning it. And when Pops told my boy that he was blind in one eye, my son said, "Hey, Pops. Cover your good eye with one of your hands." Pops obliged. Then my son did what any good, supportive person would do to his blind friend. This lovely note was plastered to my windshield on Wednesday afternoon. Let's discuss, shall we? I don't know what's worse, being called a moron by someone because of an ever-so-slightly bad parking job, or being called a moron by someone who used a double negative. Very early this morning, one of our nephews boarded a flight to California where he will join his older brother. They are two members of the same Marine unit and after training out west will deploy in August to, most likely, Afghanistan. The older of the two has seen combat before. In 2005, while serving in Iraq, he lost 22 fellow Marines and one Navy Corpsman...out of the 160 who deployed with him. This unit suffered one of the greatest losses in the war. When our nephew made it home safely, I cried every time I saw him for quite some time. Since then, he got married, had a son and his younger brother decided to follow in his footsteps. Now there are two of them going off to fight. Two children of the same mother and father who are some of the strongest parents I know. I know that every other Marine is considered family, but I'm happy they have each other too. I am already counting the days until I can cry tears of joy because of their safe return. I was going to end this by saying, "Be safe, boys", but that wouldn't be right. They are men. They are brave and strong and I'm glad they are on our side. I'm proud to know them and call them family. My husband made me cry last week. The kind of crying that makes your lip quiver and your heart hurt. The kind of crying that leaves you shaken. In a totally good way. We were enjoying a Pearl Jam concert when we heard the first few notes of the song, "Given to Fly". I threw my fist into the air, as any good rocker would, and I smiled because it's one of my favorites. Then my husband leaned into my back, laid his hands on my shoulders and put his mouth next to my ear before saying, "This song reminds me of our son." See, if you haven't known my boy from the day he was born, you don't know how far he has come. People who meet him now don't know that he barely made it through his first year. People who meet him now don't know what a fighter he truly is. They don't know that when he makes me laugh, it is a hearty laugh because I never knew if I would hear him speak. Or, when he completes his math homework that I want to burst with pride because I didn't know if he would ever be able to hold a pencil, let alone comprehend the problems. They can't look inside his chest and see his mangled heart or his stomach which often can't hold its contents. They can't look into his eyes and know that he could rarely open his right eye until it was repaired surgically. They see a little kid, but I see an amazing human being who is living proof that you can't judge a book by its cover. Today my son turns eight years old. Happy birthday, child. Fly high. Have you ever been on the phone with the resolution department of your health insurance company for the fifth time in five days, and you are trying to explain how your husband's former company left you high and dry, without insurance for 33 days, which is the same 33 days in which your husband tore his calf muscle, you had a sinus infection, your son had an ear infection and your daughter got $406 worth of immunizations, and while you're on the phone your son starts crying because he doesn't understand his math homework, and your daughter keeps tapping you on the shoulder no matter how many times you put your finger in the air to signify that she needs to wait a minute and she ignores you and keeps asking, "Can I have some grapes? ", and then the dog starts throwing up and you look in the other room to see your husband sitting on the couch playing the Wii? 1. When spring rolls around with her warm breezes and gentle rain, and the air outside is rich with the scent of lilacs, my old house starts to smell like wet dog and rotten wood. 2. When school softball, summer softball, track, baseball, going away parties, graduation parties and weddings all start to overlap, I begin to think I should increase my dosage of Zoloft. 3. Throw in a spring musical and it's time to get my Ambien refilled too. 4. But, taking Ambien makes me get on Twitter and say things like this: 'There is missional impossible musci blarking behind my head and it makes me want to put on black leggies and snaek around nmy houser'. 5. And, this: 'Now t here 's a baby crying and it's making my ovaries hurt. If I start lactating, that will just be weired'. 6. Then people named AmbienRehab start following me on Twitter. 7. My family likes to spend time playing the Wii together, but Super Mario Bros. was invented by someone with a sick and twisted view of family togetherness. 8. My son jumps around on his Hippity-Hop so much that he looks like he has a permanent, blue hemorrhoid. 9. If you go to a wine tasting and the Sommelier starts talking about "shoulders" in your wine, you may think you drank too much. 10. And, if your husband hasn't had dinner and attends the same wine tasting, he may eat half a cheeseball made of Jarlsberg cheese. 11. So when next year's invitation doesn't arrive, we shouldn't be all that surprised.